Stainless steel is popular with some gardeners because it is easy to clean. 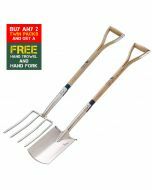 Very handy for lightly forking over the soil and for loosening weeds between shrubs and established plants. 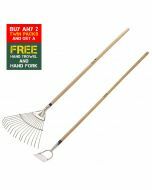 It can also be used to break down large clumps of soil before you rake it. Great for confined spaces and for planting shrubs, roses and plants in large pots or planters. Comes with treads to protect your boots.